Chloroplasts are ubiquitous organelles with a notable oxidative metabolism that are involved in free energy transduction through photophosphorylation. In addition, thioredoxin-mediated redox regulation of Calvin cycle enzymes has been shown to determine the efficiency of carbon assimilation. These provide significant evidence that chloroplasts are key cellular sites of reactive oxygen species (ROS) production, including molecules like superoxide (O2•–) and H2O2. In addition to ROS, there are compelling indications that nitric oxide (NO) can be generated in chloroplasts by both reductive and oxidative pathways. NO is involved in many physiological and biochemical processes in plants, including photosynthesis. However, many unanswered questions remain concerning how, when, and where NO is generated (enzymatically or nonenzymatically) in higher plants. 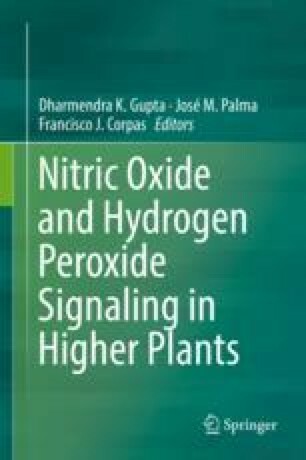 ROS and reactive nitrogen species (RNS) play a key role in signaling, but they can also be deleterious via oxidation of cell components when overproduced, as a consequence of redox imbalance and/or adverse conditions. In chloroplasts, besides the redox state and regulation of thiol groups of cysteinyl residues in proteins, identification of other types of posttranslational protein modifications (PTMs) such as Tyr nitration, S-nitrosylation, and glutathionylation has been reported. Therefore, this chapter is focused on photosynthetic light/dark reactions, antioxidant defense and thiol-based redox regulation, ROS production, NO synthesis, and its implication together with that of ROS, in PTM-mediated regulation, with the aim of drawing a picture of the importance of all of them in the regulation of the chloroplast function. This work was supported by MINECO/FEDER (Project BFU2017-86585-P) and Séneca Foundation, Murcia, Spain (Project 19876/GERM/15). The authors apologize to the scientists that are not cited because of space limitations and thank Steve Hasler for proofreading the written English of the manuscript.